The Vision’s Ancient Greece Guide Book, full of precious information and wonderful pictures, is the perfect book for those who love the Greek history, archeology and mythology. This is the english edition. The Ancient Greece Guide Book contains the history of the monuments of Athens, Corinth, Mycenae, Olympia, Crete and many other important places of the Ancient Greek civilization, along with their past & present images. In this guidebook you will find the history of the most extraordinary monuments of Athens, Corinth, Mycenae, Olympia, Crete and many other important places of the Ancient Greek civilization. 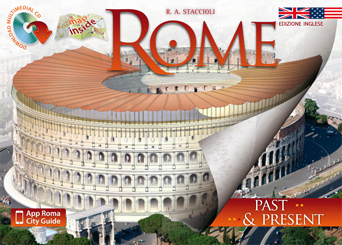 And you will find 28 amazing image reconstructions of the most fascinating monuments and temples of the Ancient Greece, that you will be able to easily overlap to photos of their present states, visually comparing the Past and the Present. 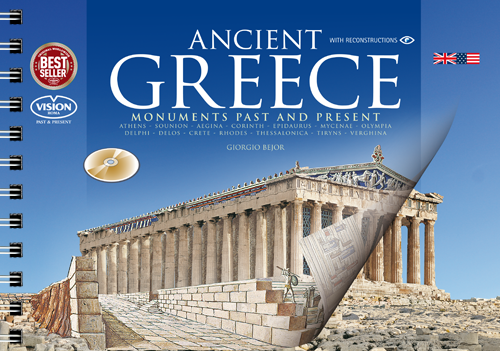 The Ancient Greece Guide Book includes a CD / DVD Rom. Reconstructions: 28. Athens: Acropolis, the Propylaea, the Parthenon (2), the Erechtheion, the Theatre of Dionysus, Odeon of Herodes Atticus, Agora. Cape Sounion: The Temple of Poseidon. Aegina: the Temple of Aphaia. Corinth: Agora. Epidaurus: the Theatre, the Tholos. Mycenae: the treasure of Atreus, Megaron. Olimpia: the Philippeion, the Temple of Hera, the Temple of Zeus, the Nymphaeum of Herodes Atticus. Delphi: Tholos of Athena Pronaia, the Temple of Apollo, the Theater, Portico of the Athenians. Delo: Cleopatra’s House. Crete: the Southern Propylaea, the Throne Room, the Queen’s Megaron, the Central Court.